The coin was issued on the occasion of the 10th anniversary of the introduction of the program to protect the black stork. The black stork is a shy bird occasionally seen in marshy waters. It is estimated that there are around seven to eleven thousand breeding pairs in Europe which is about fifty percent of the world population. As the habitat of the black stork has been encroached on and is now regarded as inadequate they have ,for the last ten years, enjoyed the protection of the Latvian ornithological society. The motif for the coin is simply an image of the black stork in the center of the inner circle. At the bottom is the name of the issuing country and the year of issue – “LATVIJA 2015”. 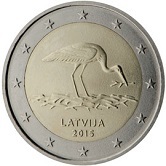 The image of a stork also appeared on the coins of the pre-euro currency the Lats.